I arrived at around 7:30am in the town square. I emerged from the bus and breathed in the cool fresh air all around me. 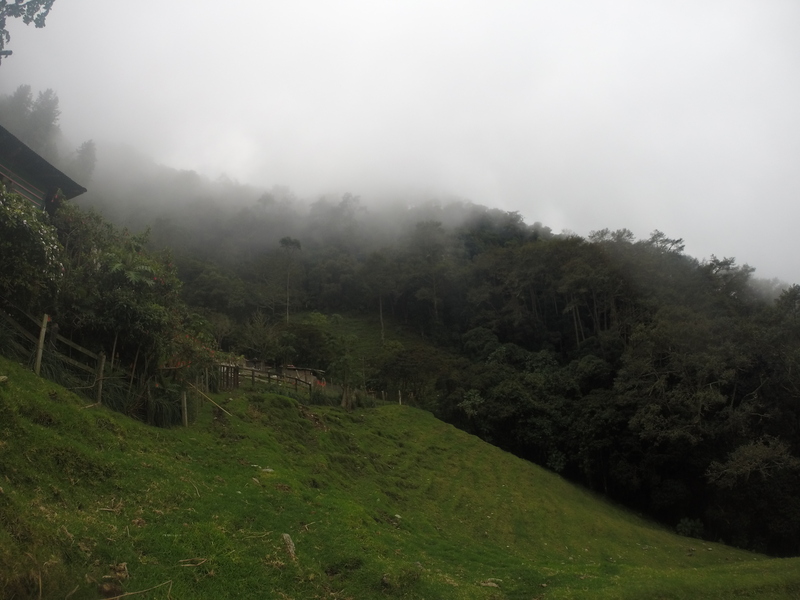 Surrounded by lush green mountains and rolling pasture, I made my way to the small farm I would be staying in. My home for the next few days was situated a little out of town overlooking a valley surrounded by dairy and coffee farms. There is only one word to describe Salento beautiful. The air is fresh and in every direction there is something breathtaking to absorb, it is literally a hidden paradise. 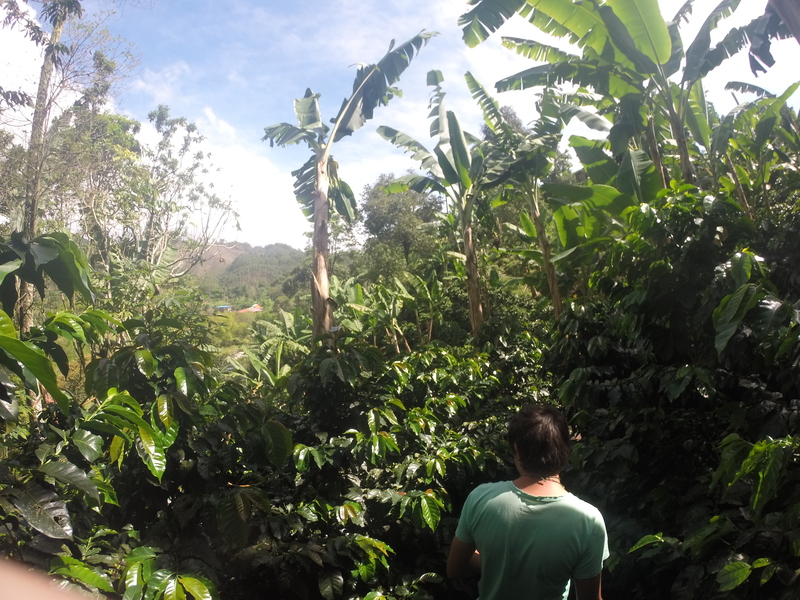 I spent the first day trekking around the organic coffee farms, and tasting and enjoying the organic treats surrounding the area. 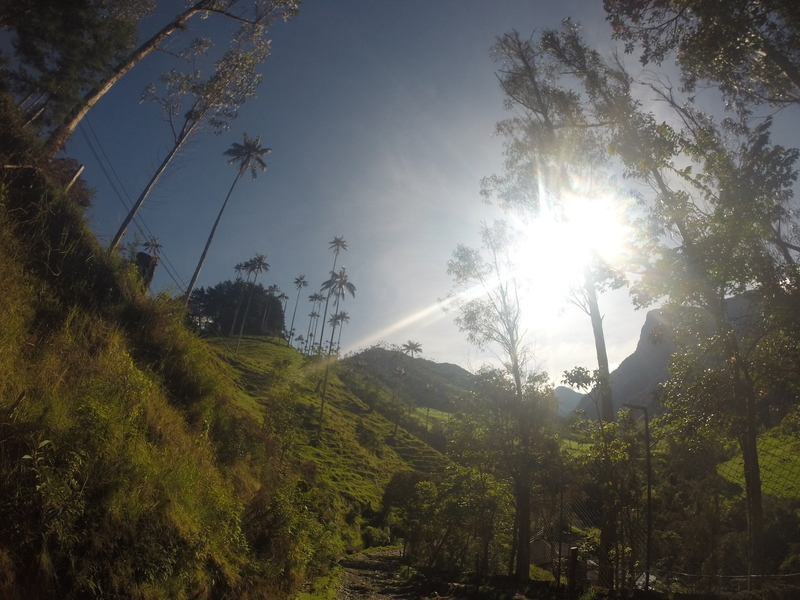 That night I made sure I got to bed early, the following day I would be heading to Valle Cocora, a huge valley containing jungle a cloud forest and the famous national tall palms of Colombia. I had an ulterior motive, I hadn’t just come for the coffee. I awoke at around 6:30am in the morning, in my bag I packed a jumper, a full 2L water bottle and my GoPro, then set out towards town. I crawled into the back of a jeep heading to the valley and discretely popped two tabs of LSD underneath my tongue. The valley was just over half an hour away and by the time we arrived I was certainly starting to feel the effects. My palms were sweating along with my forehead and I was feeling a mixture of silliness and wonder as a big stupid grin swept across my face. 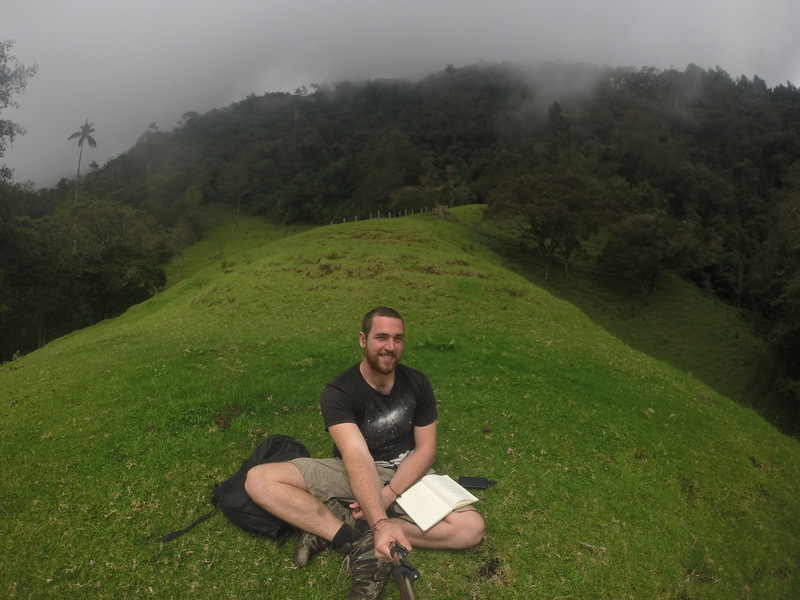 I got out of the jeep and paid my bill then found a comfy place to sit in a dairy cow field. I sat calmly waiting for the others to venture ahead of me so we would not disturb each other. As I looked around it felt as if I had descended down the rabbit hole… the valley was alive. The purple and white flowered trees peppered the strong luscious green background of the valley and the clouds were swirling, taking different shapes as the mountains seemed as if they were breathing. I had to take a few minutes to re-calibrate what I was seeing. 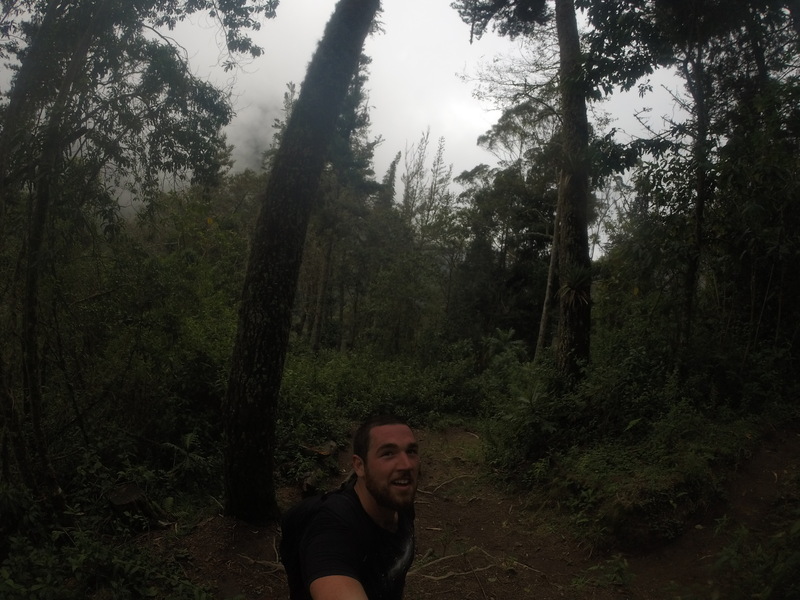 Eventually I felt ready to continue my hike and I headed into the jungle below the cloud forest. As I wandered, a feeling of connectedness and happiness continued to grow, I took my time stopping to wash my face in the river and admire the flora and fauna as I hiked. I came to a split in the road, one leading to a hummingbird sanctuary and the other leading over a mountain. My first instinct was to climb the mountain. I made it half way up bounding higher through the clouds before I realised that I had taken the path back to town. There was still so much for me to explore. I decided to run back down and check out the humming bird sanctuary before I ventured any farther. A decision that would add another two hours or more to my hike. When I arrived I was the only one there having missed the other tourist by a half hour or so. It was incredible. Hummingbirds buzzed playfully around me as I made my way up to a smoking house on top of the hill. I was greeted by an old man who offered me a cup of aguapanela, a kind of sugar tea. Having not eaten all day it was good to fill my stomach with some energy for the mountain I was about to climb, for the second time. 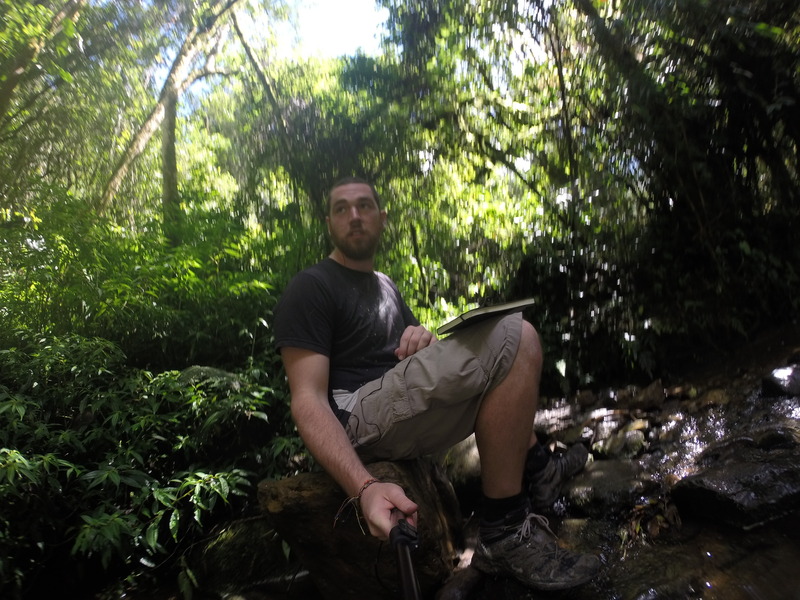 I finished my drink, thanked my host and wandered off back towards the mountain. I began to climb once again with slightly less enthusiasm in my legs this time, but spirits were high. 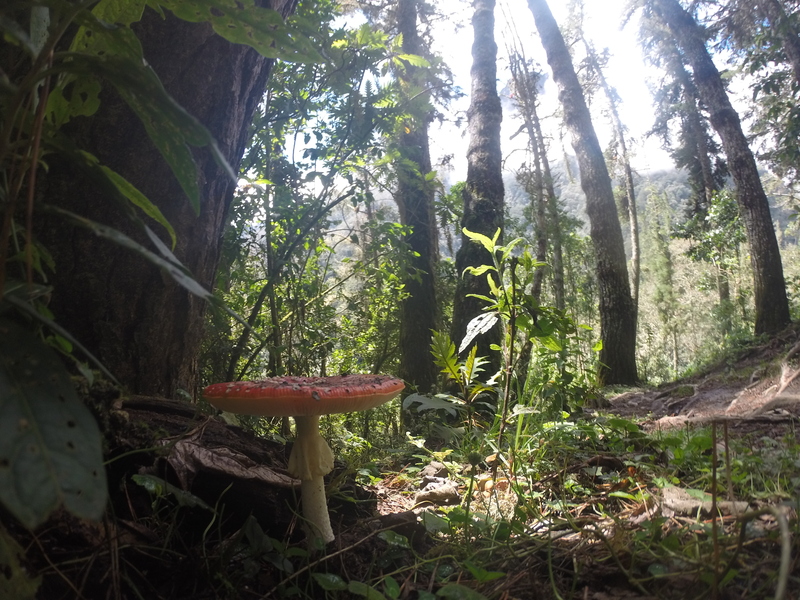 When I reached the start of the cloud forest, all around me was growing weird and wonderful mushrooms, I really felt like I was in Lewis Carolls’ Wonderland. Mushrooms and fungi of blue, red, yellow, spotted ones, bumpy ones it was magical. I arrived at a house at the top of the mountains which reminded me more of Hobbiton from Lord of the Rings. Pretty flowers and a wooden gate guarded the humble cloud covered dwelling. It was so beautiful I could cry. I stopped to take in the magnificent view and drink some water before heading off down the road. As I entered the valley from the top, rolling hills and giant palms greeted me as far as the eye could see. One of the dogs from the house started to follow me, it felt good to have a companion for at least a while, we came to an open gate leading to a clearing on a hill. I went up the hill but the dog decided to stay. I came to the top of the clearing and could see the entire valley. The sun was shining to my left, illuminating the valley and to my right the clouds were swirling around the mushroom filled forest. The contrast was beyond words. I laid down atop the clearing and put my head phones in, the sounds of Jimi Hendrix and Edward Sharpe filled my ears as I watched the clouds morph and change in front of my eyes. I sat there for hours listening to music and writing in my journal. 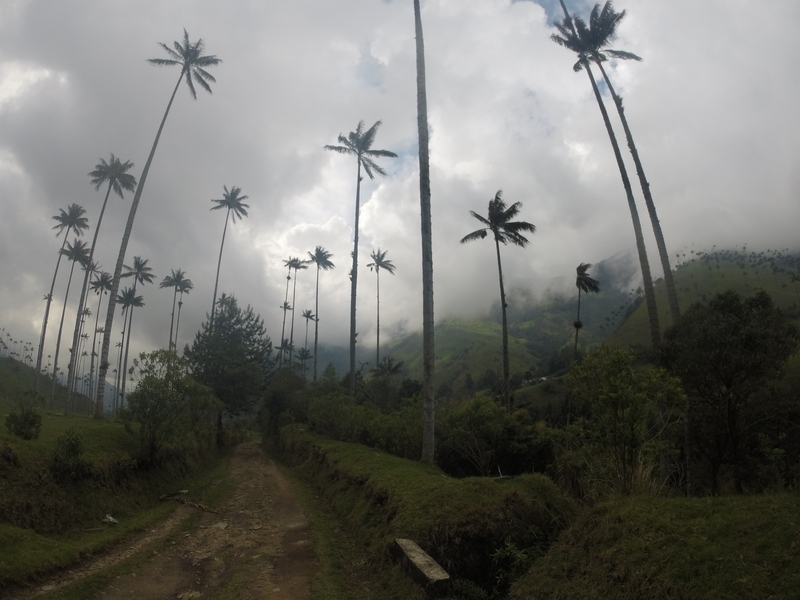 I made my way down the other side of the mountain into a field of palm trees. 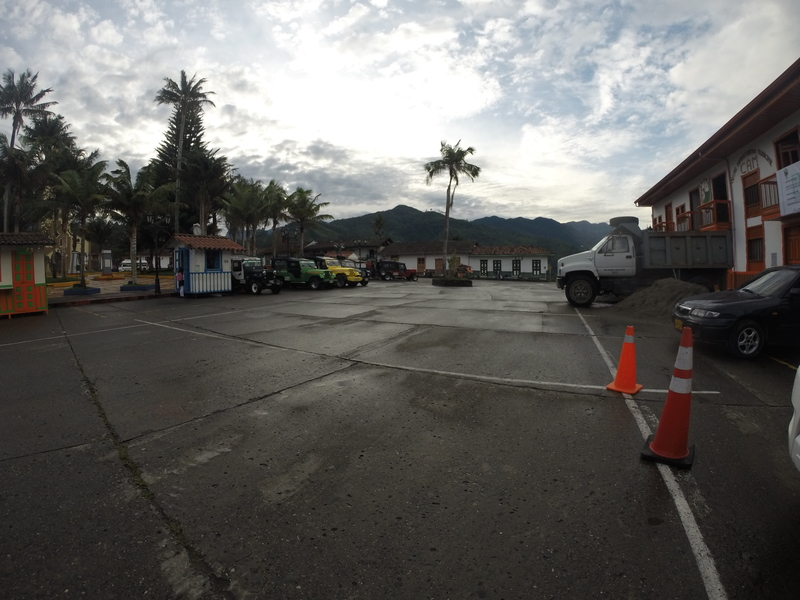 I eventually arrived in the small town at the base of the hike and waited for the jeeps to return, making my way back standing on the back of a jeep next to a young Colombian guy. He told me he was originally from Armenia but was adopted from the area by American parents at the age of only eight months. This was his first time back at the age of twenty-six. His story was touching, he had spent a week looking for his birth mother and only recently discovered he had a brother, so he was rushing to see if he could make contact before he had to make the journey home. His story was really heartwarming. I wished him luck and thought about how beautiful life can be. I headed back to the farm exhausted but happy, and spent the remainder of the night listening to music and chatting to fellow travellers. I felt very much at peace, I was thankful for the journey and had a sense of accomplishment. I had done it by myself, navigated the forest and jungle, marveled at natures beauty and appreciated what it was to be alive. 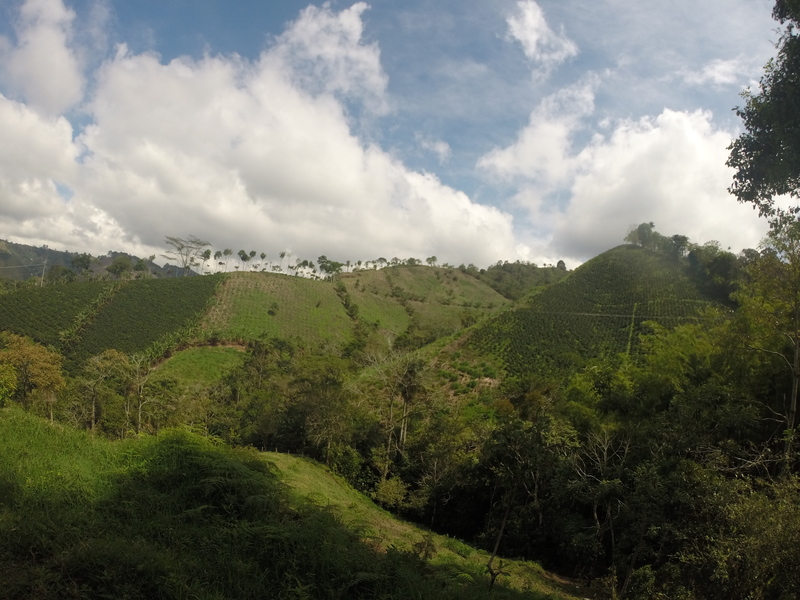 The following day was spent relaxing sipping on coffee and dreaming about my next adventure in Ecuador. Great pics, I can feel the psychedelic energy in those! 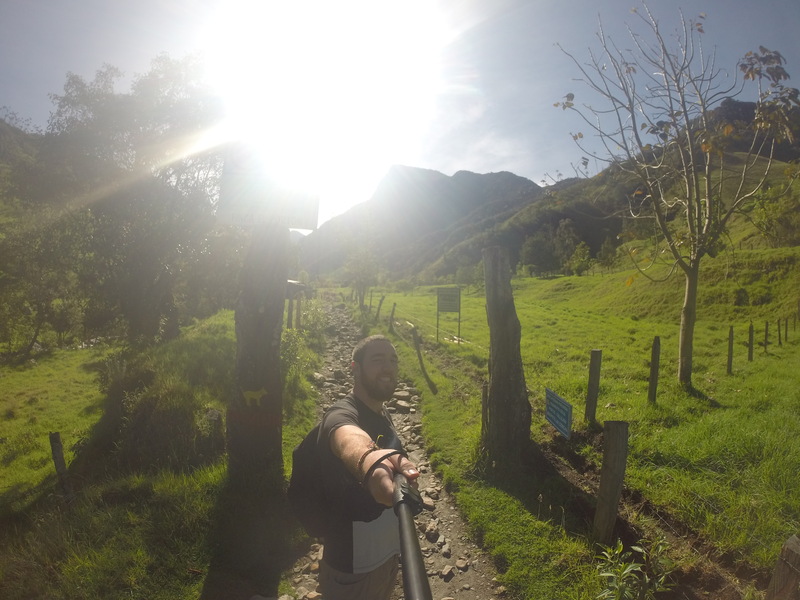 Estoy emocionado por saber de tus aventuras en Ecuador! Rides, dogs, breathtaking sceneries, mushrooms in wonderland, even some family story..